I only do my nails once every two weeks now since i've been using gel polish. I do go back and forth from gel to non-gel just so I can use some of my regular polishes sometimes. 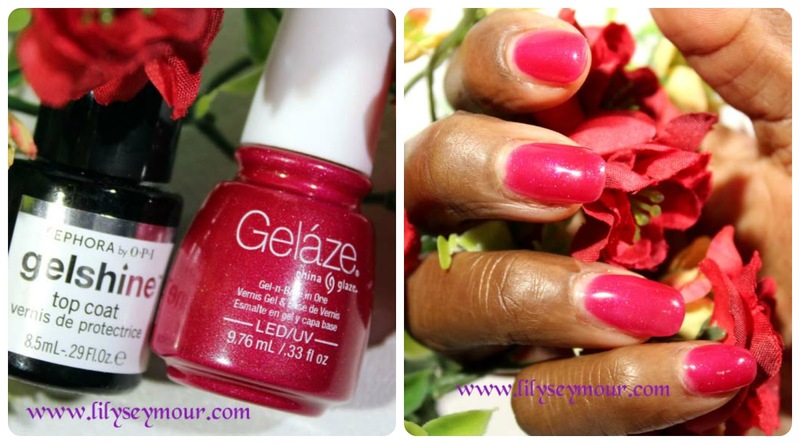 For this manicure i'm using Gelaze Gel Polish in the color Ahoy by China Glaze. I think i'm getting a little better at applying the Gel base, though I still haven't mastered the part where i'm supposed to only put a little on. So after two coats of my clear gel base, I proceeded to use the Gelaze. Although the polish wasn't watery, it was very very sheer. I had to apply three coats to get the polish to show up. Curing time under the UV/LED light was 30 mins so that was good because it allowed me to get finished quicker had it took 2 mins to cure each coat. My favorite all time gel top coat is Gelshine by Sephora. I've never seen a topcoat that shined as much as this one. I might have at least 4 backups of this because I found that you can cure it over regular nail polish as well. It takes 2 mins to cure, then just wipe the sticky off with alcohol and you're good to go if you're using regular nail polish.